if you are thinking about getting these cuffs then you should go for it! They are super comfy but they still have bite to them. They will stand up to heavy duty play, but I would not try suspension play with them. They are cute black with a red heart pattern on them. They have matching wrist cuffs also. These cuffs are best use for restraining your partner. 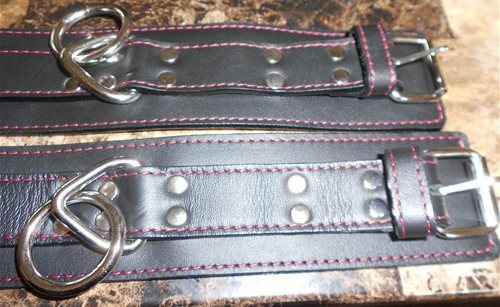 These cuffs can be used on either male or females. These are for beginners and for advanced players! They will hold up to light play and are durable enough to with stand heavy duty play. These cuffs are made of leather and some metal. They are black with red hearts and the stitching is also red. The metal is silver colored. There are 8 rivets holding these cuffs together and some heavy duty thread. I took these cuffs and stood on one end while pulling as hard as I could to try and tear them apart and they stayed intact. The metal D ring is held in place with a triangle shaped metal piece that is sewn and riveted into place. There are 11 holes for adjusting these ankle cuffs. These cuffs more then meet and exceed my expectations for them. They are very well made and will last a long time even for heavy play. They will work on both male and female partners. We did not find any other uses for the cuffs, but they sure were fun to use! Care of these cuffs is going to be to wipe them with a damp cloth if they become soiled. Do not store it until it is completely dry to avoid mold on them or a mildew smell. Wipe some leather conditioner on them once in a while ( every 6 months or so). the cuffs adjusted to the smallest setting and then adjusted to the biggest size they will go to. 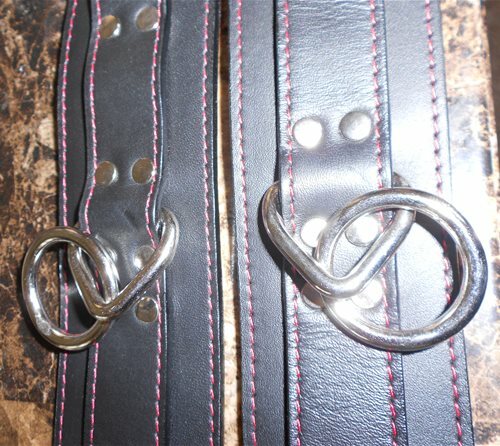 the bottom one is the ankle cuff and the top is the wrist cuff. I saw several reviews that said there was no difference between the ankle and wrist cuffs that they are the same just different costs ( the ankle cuffs are 35.69 and the wrist cuffs are 33.99). Well they are a lot alike, they are the same color and pattern, but they are different lengths the ankle cuffs are longer than the wrist cuffs and that is a good thing because the wrist cuffs do not fit around hubby's ankles. (damn good thing I got the separate sets! Just a little tid bit of information so you know what to order if you decide to order these. What toy to get with this as a gift? 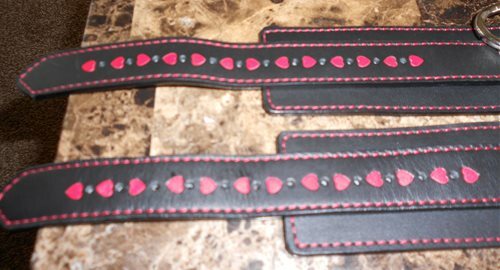 Thank you for viewing Hearts leather ankle restraints – cuffs review page!